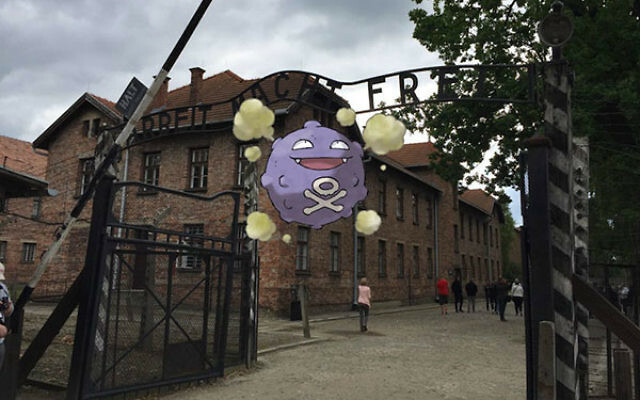 The Pokémon craze is back — and you can apparently “catch ’em all” at your local former concentration camp. Pokémon Go, a smartphone version of the popular late 1990s video and trading card game, has become an omnipresent phenomenon since its release last week. To put it in perspective: The game will soon have more Android phone users than Twitter, and it sent parent company Nintendo’s stock up 23 percent in one day. The game is an example of so-called augmented reality — it allows players to experience capturing Pokémon (the game’s various cartoon creatures) in real life, with the help of their phones’ GPS systems. A high-tech scavenger hunt, the game takes place out of doors, and sends users to PokéStops — real-life places marked as checkpoints by the game — to get in-game items. Even though the game has only been released so far in the U.S., Australia, and New Zealand, some players have already found virtual Pokémon in Israel, at sites such as the Western Wall. However, the ubiquitous game has also made its way into much more controversial territory. 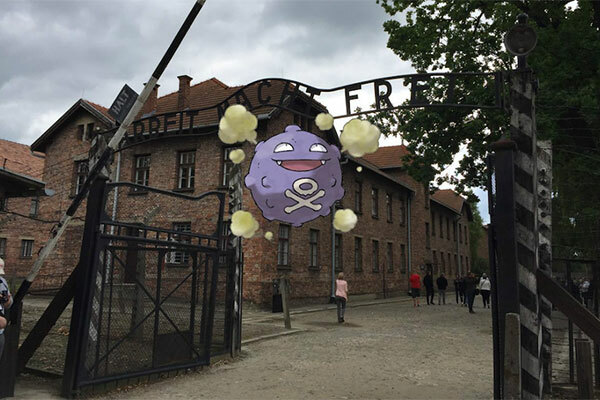 New York Magazine reported Monday that a user found a virtual Pokémon (a Rattata, to be exact for all you gamers) at the Auschwitz museum. Since then, others have discovered the animated creatures through their phones at the former Holocaust camp. On Tuesday The Washington Post reported that The U.S. Holocaust Museum in Washington, D.C. is home to three different PokéStops — and is therefore attracting people glued to their phone screens. 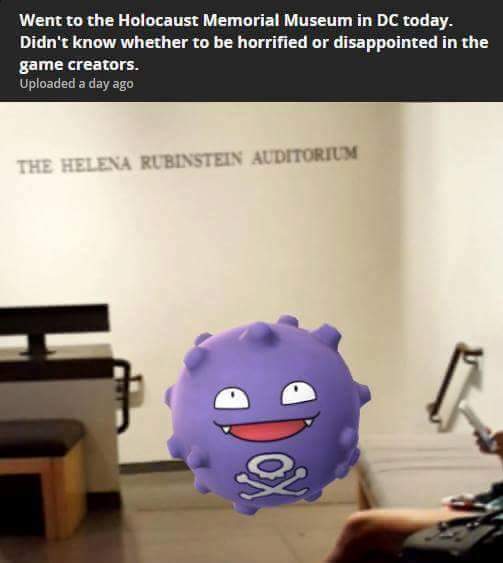 One user circulated an image online of a Pokémon named Koffing (for the poisonous gas it emits) appearing in the museum’s Helena Rubenstein Auditorium, which features testimonials of Jews who survived Nazi gas chambers. Although the image only appears in the player’s phone, it’s virtual presence is enough to get players scrambling to the spot. Jewish cultural sites are not the only ones acting as controversial Pokémon playing grounds — New York Magazine pointed out that users can play at Ground Zero in New York City, near a North Carolina statue of a confederate general, and at the site of multiple African-American mural memorials in Brooklyn. According to New York, the game’s developer Niantic ran into similar trouble last year, when one of their games, Ingress, allowed players to battle for control over real-life locations — which happened to include multiple former concentration camps, such as Auschwitz, Dachau, and Sachsenhausen. The company apologized last July. Looks like it might need to issue another statement this July.